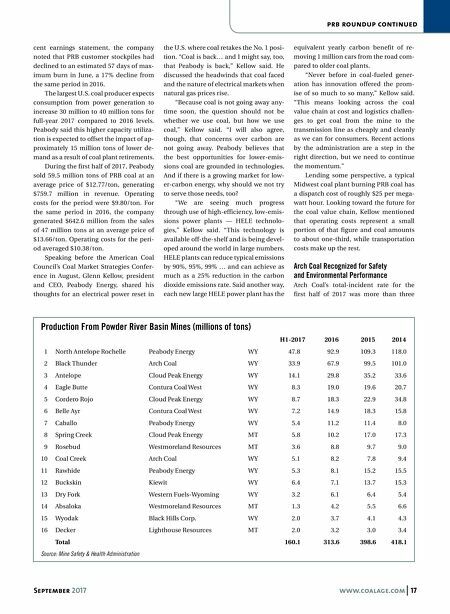 16 www.coalage.com September 2017 prb roundup America's Largest Coal Operators Finally Feel Some Relief Demand growth and lower costs are improving the outlook in the Powder River Basin by steve fiscor, editor-in-chief When the prospects for coal dimmed to their lowest point in 2016, the large western operators felt the negative impact just like their counterparts in the East, except on a much larger scale. A total of 16 mines spread across the Powder River Basin (PRB) in Wyoming and Montana produced 313.6 million tons last year, which amounts to about 42% of total U.S. coal production (738 million tons). Production from this group dropped 85 million tons (21%) from 398.6 mil- lion tons in 2015, which had already de- creased 5% or 19.5 million tons between 2014 and 2015. After a tremendous slide, seeing the trend start to reverse is a welcome sight, especially around Gillette, Wyoming, where most of these mines are located. Already year-to-date production from Wyoming is up 17.5% (See News, p. 4), according to the latest estimates from the Energy Information Administration (EIA). The official Mine Safety and Health Ad- ministration numbers presented in Table 1 lagged behind the current EIA estimates. Looking purely at the numbers for the first half, the top 10 mines appear to be on pace to produce the same as last year or a little more. Other mines, such as Arch Coal's Coal Creek and Peabody Energy's Rawhide mine, will likely do better. Kiew- it's Buckskin operation has nearly mined as much in the first half as they did last year. This year's production figures look better than 2016, but these mines will not be returning to the 2015 levels for a while. Typically, the second quarter is the slowest of the year as coal-fired power plants take units offline for maintenance before the summer cooling season be- gins. At the same time, natural gas prices climbed to $3 per million Btu or more and natural gas inventories have declined by 9%. The growth for 2017 will now depend on the coal burn associated with summer demand and natural gas prices as these factors will certainly influence utility shipments as they restock for winter. Three coal companies operate eight mines in the PRB, which produce the lion's share (78%) of the coal: Peabody Energy, 112.2 million tons (36%); Arch Coal, 73 million tons (23%); and Cloud Peak Energy, 58.3 million tons (19%). Peabody operates the North Antelope Rochelle mine (NARM). At 92.9 million tons, if it were a coal-producing country, it would be among the top 10. They also operate the Caballo and Rawhide mines. Arch Coal operates the Black Thunder and Coal Creek mines. Cloud Peak Ener- gy, which prides itself on being the only pure-play PRB producer, operates the Antelope, Cordero Rojo and Spring Creek mines. 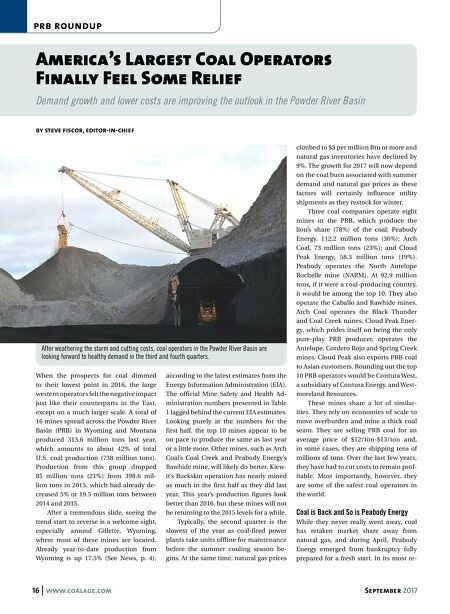 Cloud Peak also exports PRB coal to Asian customers. Rounding out the top 10 PRB operators would be Contura West, a subsidiary of Contura Energy, and West- moreland Resources. These mines share a lot of similar- ities. They rely on economies of scale to move overburden and mine a thick coal seam. They are selling PRB coal for an average price of $12/ton-$13/ton and, in some cases, they are shipping tens of millions of tons. Over the last few years, they have had to cut costs to remain prof- itable. Most importantly, however, they are some of the safest coal operators in the world. Coal is Back and So is Peabody Energy While they never really went away, coal has retaken market share away from natural gas, and during April, Peabody Energy emerged from bankruptcy fully prepared for a fresh start. In its most re- After weathering the storm and cutting costs, coal operators in the Powder River Basin are looking forward to healthy demand in the third and fourth quarters.